In addition to existing radio stations, programmes and podcasts from the BBC, the new app and website includes twenty new podcasts. Beyond Today is a new daily news podcast hosted by Tina Daheley and Matthew Price, while BBC Radio 2 quiz PopMaster gets its own podcast. New podcasts will be available from Rylan Clark-Neal, Konnie Huq, Colin Murray and the cast of EastEnders. In total the new app and website contains 80,000 hours of radio and podcasts, available online or on-demand. The experience of BBC Sounds will be personalised for each user. The BBC says the app and website are designed to learn from listening habits, “providing one-tap access to the latest episodes of favourite BBC podcasts and radio shows”. Radio shows and podcasts will also be introduced to users which they might not have discovered otherwise. More than 100 hours of classic BBC comedy and drama is newly available, as well as popular podcasts from creators outside the BBC. Forty new music mixes from experts, artists and football stars can also be streamed on BBC Sounds. 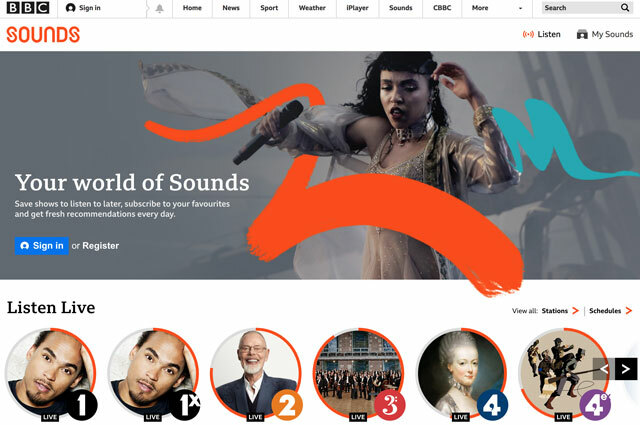 BBC Sounds replaces BBC iPlayer Radio which launched in 2012. The new app is available for Android, iOS and Amazon devices, in addition to the website at bbc.co.uk/sounds. More new podcasts and music mixes are due to be added to BBC Sounds in the coming weeks and months.